Kyle Laman, 15, was shot in the leg in the Feb. 14 massacre at his school. 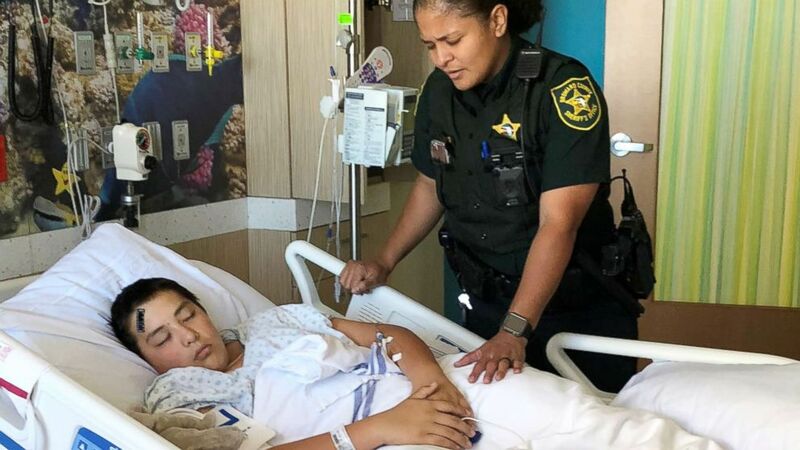 A powerful photo captured the moment when a sheriff's deputy prayed at the bedside of a teenage boy injured in the deadly Feb. 14 high school shooting in Florida. Seventeen people were killed and more than a dozen were injured in the Valentine's Day massacre at Marjory Stoneman Douglas High School. The suspect, a former student, was arrested. Student Kyle Laman, 15, was shot in the leg and needs skin graphs and surgeries to repair his ligaments. Kyle's mother, Marie Laman, said she's "so grateful" her son is alive. Laman said Kyle is in good spirits and is undergoing more surgeries. "Our community is amazing," Laman told ABC News. 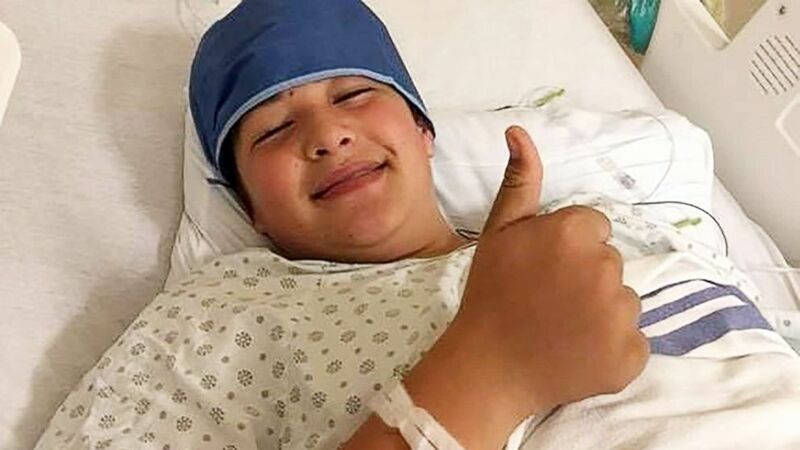 (Courtesy of Marie Laman) Kyle Laman, 15, recovers in hospital after being shot in the leg during the mass shooting at Stoneman Douglas High School on Feb. 14, 2018. Among those at his bedside was Broward Sheriff's Office deputy Brenda Louis, a mother of a teenager herself, according to ABC affiliate WPLG. Louis was assigned to a detail on the hospital floor where Kyle was recovering, and "when Kyle came out from surgery, I just felt it in my heart -- it was really heavy in me to pray for him," Louis said, according to WPLG. Louis said her sister texted her, "You need to pray for these kids -- you are placed there for a reason." With her eyes closed and her hand on his leg, Louis said "she and God were having a conversation," WPLG reported. (Courtesy Laman Family) Injured student Kyle Laman, 15, with Broward Sheriff's Office deputy Brenda Louis as he recovers following last week's mass shooting at Stoneman Douglas High School. Laman told ABC News, "Our community is amazing and has been extremely supportive." Florida Gov. Rick Scott also paid Kyle a visit, which Laman said the family is so grateful for. 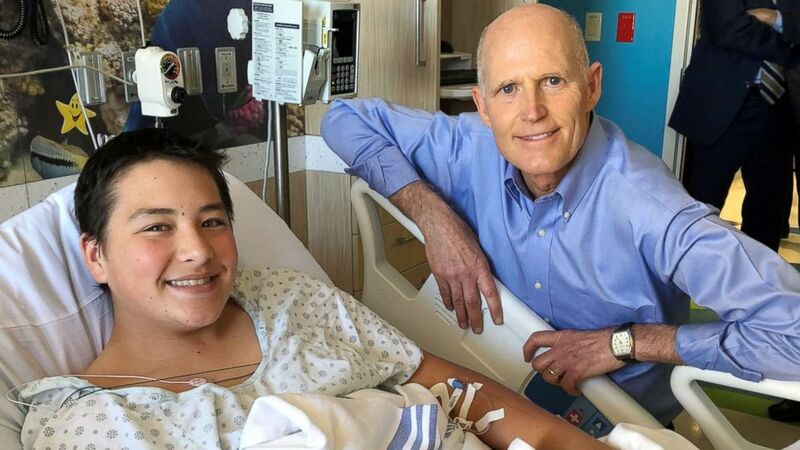 (Courtesy Laman Family) Kyle Laman, 15, with Florida Gov. Rick Scott, as he recovers following last week's mass shooting at Stoneman Douglas High School.